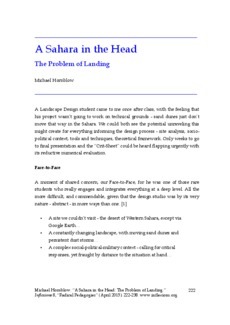 A Landscape Design student came to me once after class, with the feeling that his project wasn’t going to work on technical grounds - sand dunes just don’t move that way in the Sahara. We could both see the potential unraveling this might create for everything informing the design process - site analysis, sociopolitical context, tools and techniques, theoretical framework. Only weeks to go to final presentation and the "Crit-Sheet" could be heard flapping urgently with its reductive numerical evaluation.